OmniSite systems are tried and true; trusted by over 1,900 government utilities and municipal organizations across the U.S. and Canada. Our cellular telemetry powered remote monitoring devices provide data logging and real-time monitoring in one easy-to-use package. With OmniSite, you’ll not only have top-notch reliability and service, but an economical solution that saves you time and money. When compared to up-front fees, annual SCADA system maintenance, PLC upgrades, and software licenses, OmniSite saves municipalities thousands of dollars. Stop wasting time and money on SCADA features you won’t use and switch to an OmniSite Remote Monitoring Solution. Need to Integrate with an Existing System? OmniSite cellular monitoring systems can act as an economical backup or expansion to your traditional SCADA system, without sacrificing features or service. From backup controls to data-logging and real-time pump alarm notifications, OmniSite fits most projects and budgets. Simply install OmniSite on your equipment and you’re part of our reliable cellular network. OmniSite’s full line of remote monitoring and notification systems come standard with budget friendly, but rock-solid, operation. Click the images below to learn more about each of the products. Our systems make field installation fast and efficient. All of our systems can be installed in under 4 hours, compared to weeks or months for a traditional SCADA installation. The installation savings alone should make the switch to OmniSite a no-brainer. Our systems can be installed by anyone! From the technical genius to a technician splicing their first wire, we have a system anyone can install, setup, and maintain. After installation you simply go online and finish programming through our GuardDog web interface, no custom software installations. Just open your browser and complete two simple steps: (1) Create a “call out” list for alarm notifications. (2) Create the alarm triggers for each input channel of our equipment. Fill out a few online forms to completely program your device; no ladder logic or custom software development needed. The OmniSite system is completely cloud-based. This means all software and data is stored outside of your facility on our secure server. This saves you time, money, and energy because you don’t have to mess with software, servers, IT staff, or the electricity costs of running powerful SCADA servers. We’ve built a secure infrastructure to ensure your data is safe from web threats such as hackers, trojans, and viruses as well as natural disasters such as tornadoes, hurricanes, floods, and earthquakes. There are also physical security safe guards such as a single point-of-entry, keycard and biometric screening and video surveillance throughout. All data has electrical and communication backup systems so we can provide access to data 24/7, no matter the situation. We can go where other monitoring solutions can’t. Our reliable cellular network blankets the nation. OmniSite systems reach distant pump, lift, well, and flare stations without running expensive telecommunications lines. Using the local Cellular Network, OmniSite automatically logs every state change that triggers an alarm. Real-time alerts are sent to each devices “callout” list. The notifications can be customized to send out a text, email, and/or phone call to 15 people in your organization. Need to delay a notification? OmniSite can handle that. Need to be notified right away? 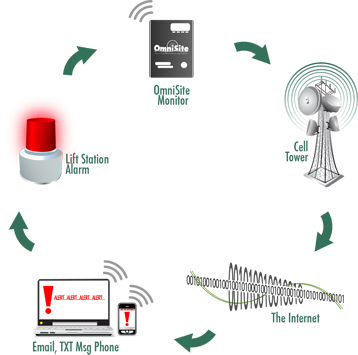 OmniSite specializes in real-time alerts and notification systems. 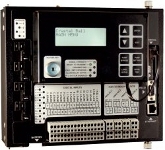 Our remote equipment monitoring system is completely customizable to your project. Don’t get locked into centralized systems with limited availability. Access your secure web-based portal from any computer or mobile device with an internet connection. Program your device, see both current and historical alerts and notifications, see important run-time data, or run reports anytime you need to. Our devices collect valuable information, so municipalities and organizations can make educated decisions on deploying technicians, which saves time and money. The simplicity of the system, reliability of cellular connectivity and the increase in monthly savings, coupled with the volume of information and enhanced control I now have over my systems, made the OmniSite Crystal Ball solution the remote monitoring system of choice for us. One of our cost savings with OmniSite is paying less overtime for call ins for pump issues. We are getting emails and texts that alert us to pump issues while operators are on duty. This allows us to be proactive with issues before major problems arise. Omnisite’s ease of installation and setup has allowed our maintenance personnel to install units on their own, program notifications to whomever may need them at any time, and swap out any parts without calling in for outside service help. I purchased my first SmarteLight this week and installed it yesterday. I cannot say enough good things about your sales and tech. support staff. I found them to be very easy to reach and very knowledgeable and helpful. Installation and set up was very user friendly, and the light met all expectations. I have about two dozen different systems and hope to install one on each. I believe the product and the GuardDog service are reasonably priced and again thank you for your kind service.